The Hack of Honor idea is to create a sort of equivalent to a Guest Of Honor slot, for a project rather than a person. We're excited to announce that the inaugural Penguicon Hack Of Honor is the Giant Singing Tesla Coils, that were featured at DuckCon, and became popular on YouTube! 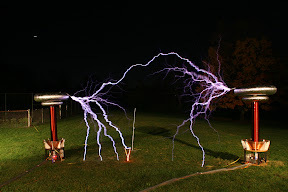 Steve Ward, Jeff Larson and friends will bring two seven-foot-tall tesla coils to do several concerts. April 18 through 20, 2008, in Troy Michigan, we will make music with lightning! 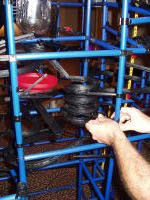 This customizable marble roller coaster will be open all weekend for Penguicon attendees to tinker with. It serves as a metaphor for the open source development process. Although the giant room-sized version of the contraption will not be here this year, the Hamtramck Idea Men are donating their Chaos Tower to Penguicon. Each year, we plan to purchase additional Chaos Toy kits until one day we will match the size of the one which, in the past, was shipped in boxes to Penguicon from across the country. This popular attraction will live right here in Michigan and be available for your use every year! This year's computer lounge is brought to you once again by the Greater Lansing Linux User Group. Feel free to drop on by to check your mail, browse the web, and perhaps find out a little bit more about open source software. You can also check out some technology demos that help show off the real power of Linux, and use our CD burning station "The Burn Unit" to take home your very own copy of Linux to try on your computer at home. Are you attending Penguicon and are artistic? Do you have something you created that you'd like to offer to the Penguicon attending audience? Use our new Artist Alley! From 11am-6pm on Saturday, April 19, just outside of Ops, there will be open tables for you to set up and display your creations! Contact dean_stahl@cablespeed.com and get registered to show off your work. Space will be limited, so signing up for time will be of great help to the co-ordinator. This year, we will have it for no cost to the artists. Sign up now and come show your work to the world of Penguicon. 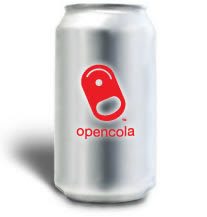 Speaking of metaphors that help to explain how the free and open source development model works: Penguicon's former Guest of Honor Cory Doctorow and Nifty Guest Karl Schroeder used to be involved with a company named OpenCola. In addition to creating open source software, they sold a soft drink with a public recipe that anyone could use or modify to brew up the black waters of corporate imperialism in their own kitchen. Well, we did just that. We made a Penguicon build of the OpenCola recipe and served it in our hospitality suite. Never fear, the bathtub was still full of ice and complimentary cans of Coke and Pepsi for all Penguicon attendees. But thanks to the expertise and craftsmanship of our food chemistry team, there was just as much demand for Open Cola as name-brand cola. In subsequent years we expanded to original non-cola flavors and became the OpenSoda project. Liquid Nitrogen Ice Cream is a Food Track event that takes place many times over the weekend in the hospitality suite. Homemade ice cream is instantly created, in a variety of custom flavors, by adding liquid nitrogen to the recipe at negative 320 degrees Farenheit. The nitrogen boils off and goes out the window, leaving behind the other ingredients frozen into a smooth, creamy dairy dessert. It is truly a spectacle to behold! And the range of strange and imaginative flavors that work with this process is much wider than with normal ice cream. Bring your own crazy combo of flavor ingredients and challenge us! This year we are asking our Guests and Nifties to each design an ice cream flavor named after them. See demos on our video page. Penguicon 6.0 in 2008 will have a multiplayer computer gaming room! The organizers of MPCon will lend their expertise from running an annual 200-person frag fest in Dearborn-- the largest in the Midwest. They'll take over a room for ninety people to set up their computers on servers the MPCon folks will run. A seat to set up your computer in the LAN room will be indicated by a $10 wristband, and can be reserved when you register for your Penguicon admission badge. In addition, MythLogic agreed to set up computers to be rented by Penguicon attendees who didn't bring their own. Feel free to practice up before the LAN for maximum pwnage! Have fun with your fellow Penguicon attendees by attending the most fun side-event at Penguicon. Whether you are an expert shooter who wants to make sure they don't miss weekly practice, or a novice who has never shot before, there will be something for you at Geeks with Guns. If you are a beginner, Penguicon will be providing introductory instruction into handgun operation. You will learn basic handling, safety and range rules. If you are an experienced shooter, you will enjoy the 25-yard climate-controlled indoor pistol range. Signup for Geeks with Guns is available through the Penguicon online registration form when you get your convention badge. From the nation that is one of the world's centers of Free/Libre Open Source Software and the Free Culture movement, comes a traditional folk recipe worthy of the second-largest beef producer in the world. The beef is specially cut into chunks, and grilled on skewers surrounded by rocks of pure rock salt. The salt melts as a coating on the meat and seals in the flavor, but it does not overly salt the food. Here's the story of how this came to be at Penguicon. Eduardo Cesconnetto is from Brazil, and grills beef in the Brazilian style for the annual meeting of the Greater Lansing Linux User Group. It's so much better than any beef they ever tasted, it's difficult for the GLLUG guys to eat meat in any other form ever again. So, last year we had a Penguicon barbecue! There was a line at the Operations desk waiting for the signup period, stretching all the way across the Ballroom Assembly area. We handed out the steak during two or three scheduled periods during Saturday afternoon in the Consuite, for those who had preregistered. It was a great hit! Signup for Brazilian Beef is available through the Penguicon online registration form when you get your convention badge. We will be able to serve more people this year, and you will get quite a sizable portion. Sign up while you still can, because there's a limited quantity and it's going fast. The Masquerade returns! Check here for the rules. April 18-20 2008, Sanctuary Press will once again host a SF/F Writing Workshop with program content each day of the convention. This workshop is open to NEW or UNPUBLISHED genre fiction writers. We're happy to introduce up to eight new writers into SF/F writing, critique, networking and publishing. Be a part. Submitters, refer to the FAQ post for this convention at http://spwritersworkshop.blogspot.com/. Submission guidelines and news of the workshop will appear there as it is made available. Submissions for this workshop are now OPEN. If you plan to attend Penguicon 6.0 this year, send a completed second draft of your short story or novel excerpt to spwwcore-owner AT yahoogroups DOT com as an RTF attachment. All manuscript should be of a Prose Speculative Fiction genre, no longer than 5000 words, and must be received by Midnight EST on MARCH 31, 2008. For rapid processing, ELECTRONIC SUBMISSIONS ONLY will be accepted. Please follow standard manuscript format, AKA , and make sure that you include your name, age, address, and e-mail address with the submission in an accompanying email. * - Feel free to send a short email to spwwcore-owner AT yahoogroups DOT com with any questions regarding our current submission guidelines. (brought to you by Morton's List and a grant by the Ann Arbor Science Fiction Association.) This is a capsule toy vending machine that dispenses destiny. Your random adventure, designed by the creators of Morton's List, will send you off into the convention to have strange experiences you wouldn't have otherwise, with people and things you may have overlooked.